The U.S. Geological Survey, in cooperation with the Minnesota Pollution Control Agency, completed a study on the occurrence of pharmaceutical compounds and other contaminants of emerging concern in shallow groundwater in non-agricultural areas of Minnesota during 2013. This report describes the study design and methods for the study on the occurrence of pharmaceuticals and other contaminants of emerging concern, and presents the data collected on pharmaceutical compounds. Samples were analyzed by the U.S. Geological Survey National Water Quality Laboratory for 110 pharmaceutical compounds using research method 9017. Samples from 21 of 45 wells had detectable concentrations of at least one of the 110 compounds analyzed. One sample contained detectable concentrations of nine compounds, which was the most detected in a single sample. Fewer than five compounds were detected in most samples. 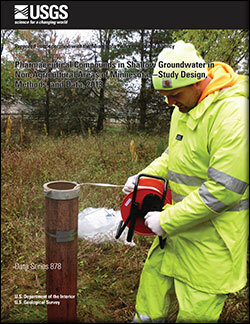 Among all samples, 27 of the 110 compounds were detected in groundwater from at least one well. Desmethyldiltiazem and nicotine were the most frequently detected compounds, each detected in 5 of 46 environmental samples (one well was sampled twice so a total of 46 environmental samples were collected from 45 wells). Caffeine had the highest detectable concentration of all the compounds at 2,060 nanograms per liter. Elliott, S.M., and Erickson, M.L., 2014, Pharmaceutical compounds in shallow groundwater in non-agricultural areas of Minnesota—Study design, methods, and data, 2013: U.S. Geological Survey Data Series 878, 11 p., https://dx.doi.org/10.3133/ds878.